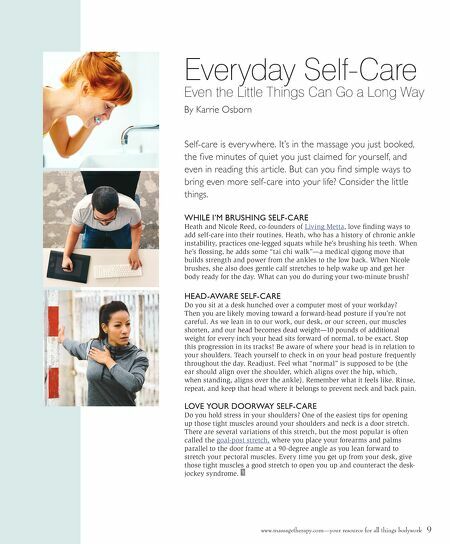 www.massagetherapy.com—your resource for all things bodywork 9 Everyday Self-Care Even the little things can go a long way By Karrie Osborn Self-care is everywhere. It's in the massage you just booked, the five minutes of quiet you just claimed for yourself, and even in reading this article. But can you find simple ways to bring even more self-care into your life? Consider the little things. WHILE I'M BRUSHING SELF-CARE Heath and Nicole Reed, co-founders of Living Metta, love finding ways to add self-care into their routines. Heath, who has a history of chronic ankle instability, practices one-legged squats while he's brushing his teeth. When he's flossing, he adds some "tai chi walk"—a medical qigong move that builds strength and power from the ankles to the low back. When Nicole brushes, she also does gentle calf stretches to help wake up and get her body ready for the day. What can you do during your two-minute brush? 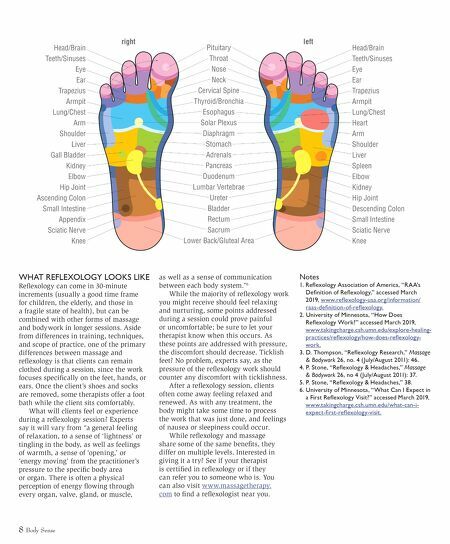 HEAD-AWARE SELF-CARE Do you sit at a desk hunched over a computer most of your workday? Then you are likely moving toward a forward-head posture if you're not careful. As we lean in to our work, our desk, or our screen, our muscles shorten, and our head becomes dead weight—10 pounds of additional weight for every inch your head sits forward of normal, to be exact. Stop this progression in its tracks! Be aware of where your head is in relation to your shoulders. Teach yourself to check in on your head posture frequently throughout the day. Readjust. Feel what "normal" is supposed to be (the ear should align over the shoulder, which aligns over the hip, which, when standing, aligns over the ankle). Remember what it feels like. Rinse, repeat, and keep that head where it belongs to prevent neck and back pain. LOVE YOUR DOORWAY SELF-CARE Do you hold stress in your shoulders? One of the easiest tips for opening up those tight muscles around your shoulders and neck is a door stretch. There are several variations of this stretch, but the most popular is often called the goal-post stretch, where you place your forearms and palms parallel to the door frame at a 90-degree angle as you lean forward to stretch your pectoral muscles. Every time you get up from your desk, give those tight muscles a good stretch to open you up and counteract the desk- jockey syndrome.